Last night the UFC visited Brazil for UFC Fight Night 51: Bigfoot vs. Arlovski II. 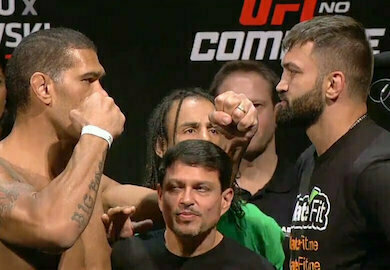 The event featured a rematch of the legendary 2010 bout between Andrei Arlovski and Antonio Bigfoot Silva under the Strikeforce banner that saw Bigfoot Silva pick up a unanimous decision victory. Last night was a different story, in the first round of their 5 round main event bout, Andrei Arlovski dropped Bigfoot Silva and poured on the ground and pound until the referee stopped the bout. During the post-fight press conference UFC exec Grace Tourinho revealed that the event held an attendance of 8,822. Out of a total of 4 trips down to Brazil so far this year, this event ranks second in terms of attendance. The most attended event was the TUF Brazil 3 finale earlier this summer that had an attendance of 8,986.